Two ways to do dips. "My, what strong arms you have..."
Why workout to get big arms? 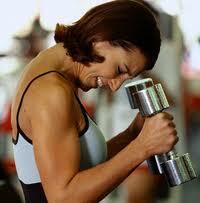 For starters, the upper and lower arm muscles are involved in almost any activity we do. Even though we are admonished to “lift with our legs,” most lifting cannot avoid the activation of one of the major arm muscle groups; the biceps, triceps or wrist flexors and extensors. 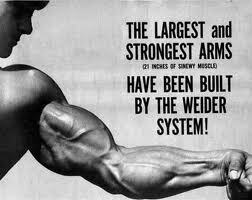 In fact, arm muscles seldom work alone. 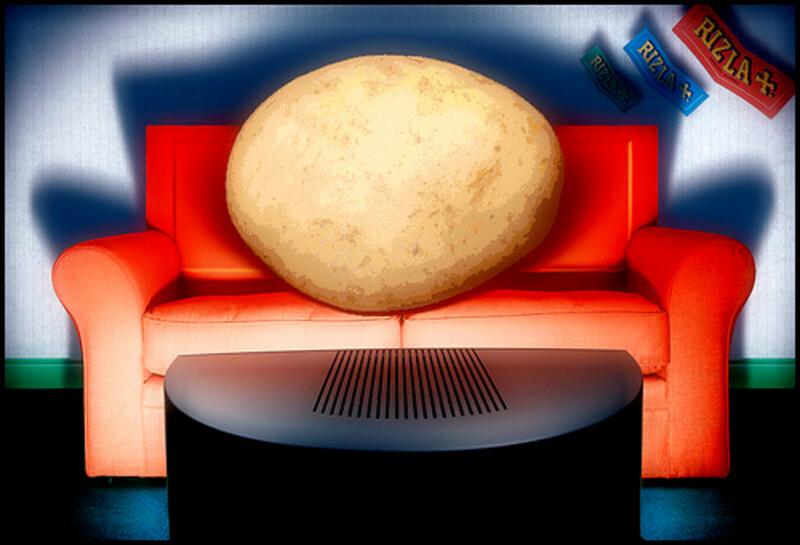 They play a supporting role more often than not. For instance, pushing a shopping cart involves the triceps, but most of the work is done by the lower body; picking up a child from the ground involves the whole body, but the biceps are heavily engaged. Doing arm exercises makes other daily activities easier; picking up and carrying groceries is an obvious example, and if it’s your unlucky day to move, strong biceps and wrist flexors can take a lot of strain off of the lower back when carrying boxes. Learning how to get big arms is easy. Putting in the work to make it happen is the real challenge. Here are a couple of bicep and tricep workouts filled with arm exercises you can do almost anywhere, and with minimal equipment. Warm-up: Don’t just jump into an arm workout, start with 10-15 minutes of steady cardio. Alternatively, move a light kettlebell through a circuit of swings, cleans, halos and ribbons before getting into arm specific exercises. Specific Warm-up: This is simply doing the first exercise for each muscle group with a light weight in a controlled manner. In the case of pull-ups, partial repetitions or hanging from the bar with the lats engaged may be enough. 3-4 sets of 8-12 repetitions for intermediate and advanced trainees. “21’s” are barbell or dumbbell curls performing 7 reps from bottom to middle of the movement, 7 reps from middle to the top half of the movement and 7 full curls to finish. Do the “21’s” bicep curls immediately following the pull ups. Rest 60-90 seconds between sets. 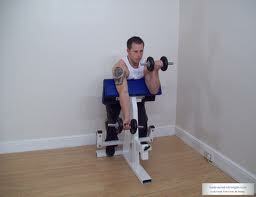 Alternating dumbbell curl “triplets.” 3-4 sets of5-8 repetitions. These can be done seated or standing. A triplet in this case means a regular dumbbell bicep curl, followed by a hammer curl (dumbbell is vertical,) followed by a reverse curl (palm is down.) These three movements comprise one repetition, now repeat 5-8 times. Because of the inherent pause between movements, don’t wait too long between reps. When you have finished, stretch gently. Your body will thank you. How do you make this an “anywhere” workout, or one that utilizes more of the toys at your gym? 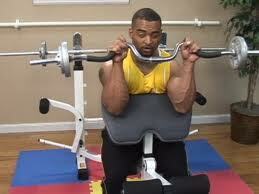 Use the back of a chair or couch as an improvised “preacher curl” if you are working your arm muscles at home. People who don’t have traditional weights can substitute a weighted backpack, water bottles, jugs or cans in a grocery bag in a pinch. Ditto for those on the road. To add a level of intensity at the gym, do weighted underhand pull-ups and perform the “21’s” or the dumbbell “triplets” on a preacher curl bench. Now the triceps. There is a simple trick to imposing more work on this three-headed muscle: Keep the elbows in. Do not allow the elbows to flare and the triceps will end up with the brunt of the trauma-exactly what we’re looking for. x 8-12 (or burnout, even if that means 30 reps.) At home or in the park, utilize a bench, chair or the side of the bathtub and get in pushup position. The body should be a straight line from head to toe. Now, with the elbows in, scoot back until the elbows are at about shoulder level. Lower your head to the surface of whatever you’re holding by bending your arms at the elbows and extend back up. Basically a reverse skull crusher or French press. The exercise can be made harder by moving the body farther back from where the hands are supporting it. 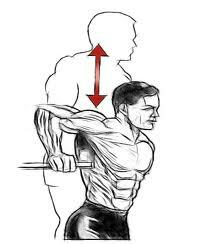 Dips: x 8-12 (or burnout; if more than 12 add weight.) People doing these without dip bars can set up a pair of sturdy chairs on a non-slip surface. 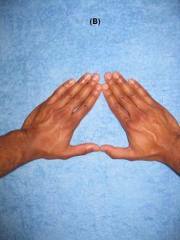 To perform triangle push ups, touch the index fingers and thumbs of both hands while assuming a push up position. Do 3-4 x burnout. To add weight, wear a weighted vest, chains or resistance bands. Keep track of your progress and stick with these routines for a minimum of 4 weeks before changing it. 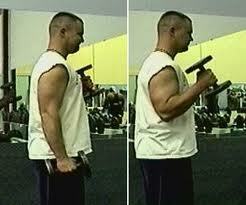 With diligent and consistent effort, you can’t help but get bigger and stronger with these arm exercises.